An Elvis impersonator from Portugal has won a tribute contest in the UK, and will now compete at the world championships in Tennessee. 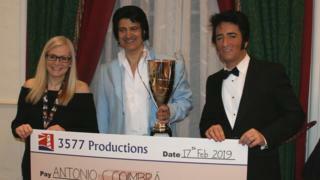 Antonio Carlos Coimbra won the Harbour Lights Elvis Festival at the weekend. A total of 26 Elvis tribute acts from around the world had donned their blue suede shoes to compete in the event at the Mercure Hotel in Bristol. Organiser Paul Phillips said Mr Coimbra was "vocally fantastic". He will compete for the world title in August. The competition is the UK's only official qualifier for the Images of the King World Championship. Mr Phillips said: "He's a really, really good singer and we're really pleased he will be representing us in the world championships." "There's a cash prize and it opens many many doors - and even getting to this stage Antonio will be showcasing himself in front of a whole new audience," he added.